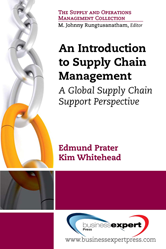 An Introduction to Supply Chain Management: a Global Supply Chain Support Perspective offers an overview of supply chain management and provides a framework for subsequent, more detailed study in various aspects of supply management. The book reviews the evolution of supply chain management concepts and discusses trends in global markets and strategic competitiveness. It then focuses on the major issues involved in managing a competitive supply chain including: forecasting, inventory management, distribution, dealing with uncertainty, reverse logistics, and customer service. Coverage of the dynamic, evolving issues pertaining to supply chains that affect the global business community concludes the book. Readers of An Introduction to Supply Chain Management will be better equipped to conceptualize the management of supply chains as a collection of business processes; identify primary and secondary value chain processes; distinguish between the umbrella term, 'supply chain management,' and its component functions; and understand the basic tools of forecasting and the need for accurate data and forecasts on which to base supply chain management decisions.